Hi folks. Here we are enjoying the Monsoons. In fact we Indians, celebrate each season with much enthusiasm. We have so many ways to celebrate them-festivals, songs, dances and of course food. Monsoon is celebrated as we get refreshed with the showers after a long hot and dusty summers. The rains bless us with not only, cool climate but also the much required water filling up our lakes, rivers and other water bodies. India being predominantly an agri-based country, our farmers start their activities. Well whether in cities or towns or in villages, everyone needs some hot, healthy food which is also very yummy. Moreover, if you can make it easily with simple ingredients then it is worth noting down and trying. Sweet corn has become very popular in India and is now readily available through out the year in super markets as well as our local vegetable markets. We can get the corn cobs and separate the kernels or if we don't have that much time separated kernels are also available but a bit pricey. Sweet corn is delicious and healthy. It is rich in fiber, vitamins and minerals. It is sweet to taste and can be eaten raw, if it is fresh. Bring to boil 2 cups of water in a pan, add a cup of sweet corn, cover and cook on low heat till done. Drain the water, and it is ready for use. If the corn is fresh and tender, it will be cooked within 5 to 10 minutes. This will serve one person. 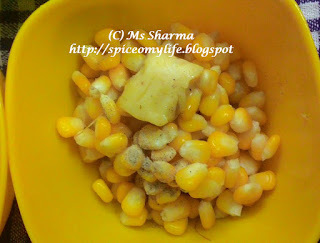 Take the boiled corn in a serving cup/bowl, add butter, salt and pepper powder. Mix well and serve hot. Since we use hot boiled corn, the butter will melt by itself. Serve it hot. 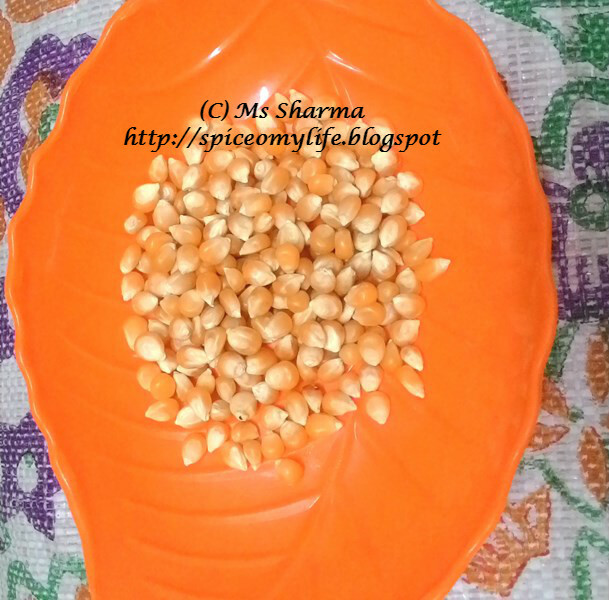 Take the boiled corn in a serving cup/bowl, add salt and pepper powder. Mix well and serve hot. 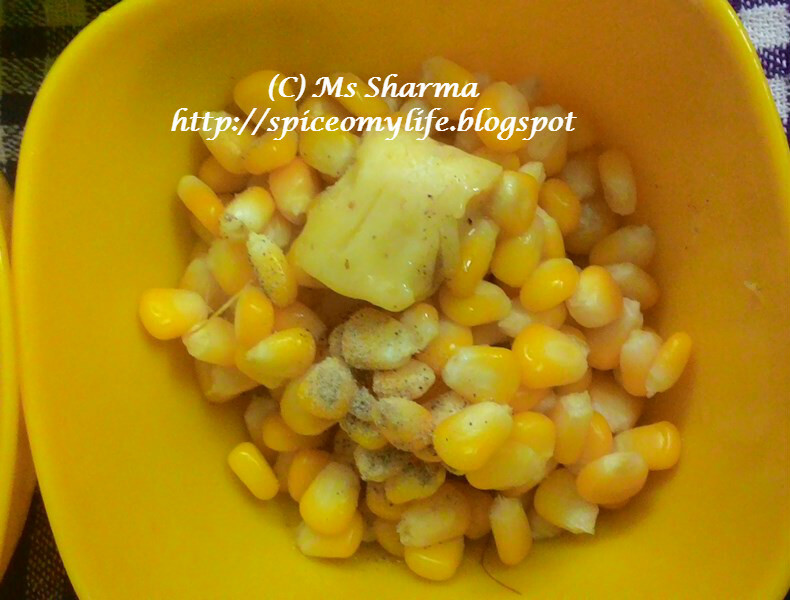 Take the boiled corn in a serving cup/bowl, add salt, butter and spices. Mix well and serve hot. Take the boiled corn in a serving cup/bowl, butter and sauce. Mix well and serve hot. The Sauce contains salt and oil. So adjust the quantity of butter or avoid it if you don't want it to be too fatty. I prefer to add butter as the sauce is spicy. Similarly for the salt, first add the sauce to the corn and if required add salt according to your taste. The Sauce contains salt and oil. So adjust the quantity of butter or avoid it if you don't want it to be too fatty. We all love popcorn. Don't you? Actually snacking on it while watching a movie is what I like. It is a healthy and nutritious snack. Have you ever made popcorn on the stove? Do you know how popcorn was traditionally made? Well these days you have machines for that. But traditionally popcorn in India was made and still being made in villages and little towns in two ways. One is no oil and the other is with oil method. In earlier days, some farmers in the village used to puff up the grains like wheat, rice, corn etc and sell them. They use hot sand for this. 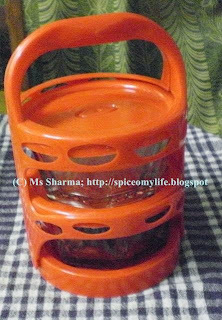 This method is also used to roast peanuts, chickpeas, peas etc. The veranda or the room in the front serves as a shop for them. Even today some people are dependent on this as occupation. They either use their own grain, in which case they charge for the entire thing. We can also give them the grain and get it puffed up. They charge some meager amount for this. In this method, a big iron wok is kept on a stove made of bricks and plastered with soil and cow dung mixture. Now they are using iron stoves. Wood is used as fuel. Other things like, coal, husk, wood shavings, saw dust, bagasse(the remains of sugar cane after the juice is extracted), or other agri waste like dried wheat/rice/grain stalks after harvesting may also be used. The wok is filled with fine sand. Once the stove is lighted, the sand is left to heat up. Then they add the maize kernels(corn seeds), on to the sand and close it with a lid. When the kernels pop out, they are removed and sieved to remove any sand. In order to make it salty, the corn kernels are put into salted water for sometime and then dried. Unlike what people think, sand does not stick to it. So it is quite safe to eat. This is healthy as there is no oil is used for making the popcorn. My grandmother and my mother too used to make this way. Even I use this method it some times. This was most popular before the machines came into the market. 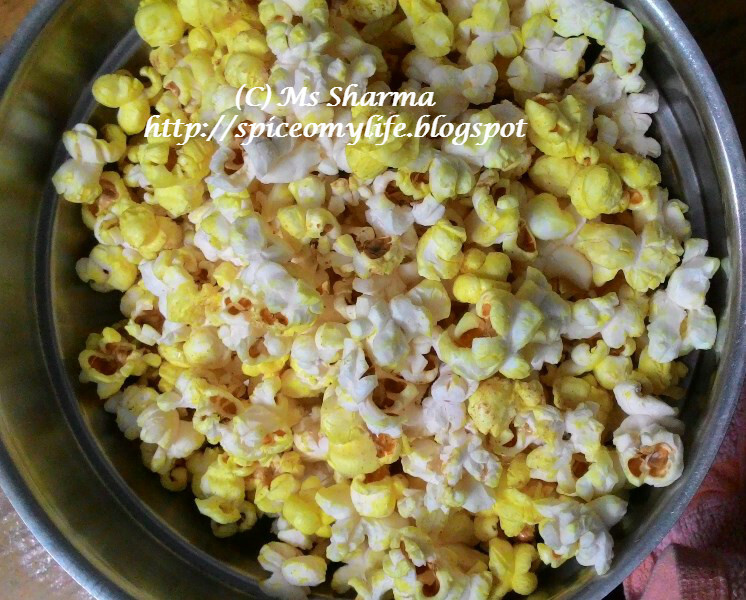 Here is how I often make simple popcorn. Heat oil in a heavy bottomed pan. I use my cooker. Once oil(butter) is hot, reduce the flame to minimum, add turmeric, salt and the kernels. Just stir it once so that turmeric and salt get coated onto the kernels and close with a lid. Let it sit for a while. The kernels start popping. Wait until the popping stops. Now it is ready to eat. This is very easy to make, healthy, hygeinic and less costly. It can be prepared in just 10 minutes. Goes well with afternoon tea too. This hot summer is time for pickles- the King of all Pickles, that is, Mango Pickles known as Avakaaya. Of course the pickle made from Gongura(a kind of sour leaf) is the Queen and nothing beats it No function, or feast is complete in our India especially our Telugu States with out the pickles. Of all the pickles, mango pickles are the most popular ones. For us Telugu people making pickles from Mangoes or red chilies or raw tamarind or Gongura is nothing less than a sacred ritual or doing meditation. It is done with lot of care. Every family has its own secret recipe, ingredients and its own traditions connected with pickling. The grand mothers take care to see that these are followed every year and are handed down to the next generations. The ladies have to take bath, wear clean clothes, clean the kitchen or the area of operation, tools and ingredients to be used thoroughly. Pickles are also stored with great care in big ceramic or glass jars covered with clean cloths. Once in a week or fortnight, required portion is taken out for daily use in smaller containers. I still remember my granny making huge amounts of pickles storing them filled in very big ceramic jars in the pantry and touching them only after a bath. No one else is allowed to touch them. All this because one careless mistake will spoil the pickles which other wise can be stored for an year and many years if need be. I have already talked about the proper storing of pickles in my introduction to pickles in my previous posts. No matter how many containers, jars or bowls we have, we women are always looking out for the latest ones so that our tables look great while dinning. Here I am going to show you the latest storage containers meant for our table. It is pickle caddy with two glass bowls. 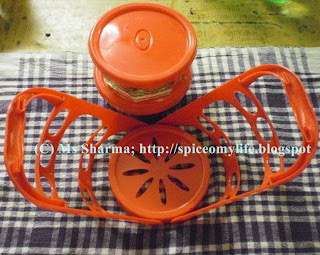 As you can see there is a plastic caddy which can be opened when needed and closed tight after stacking the bowls one upon another. The glass bowls (thank God for that!) have plastic lids (which I don't like much as it is meant for pickles). One more thing is it is available in only one colour. 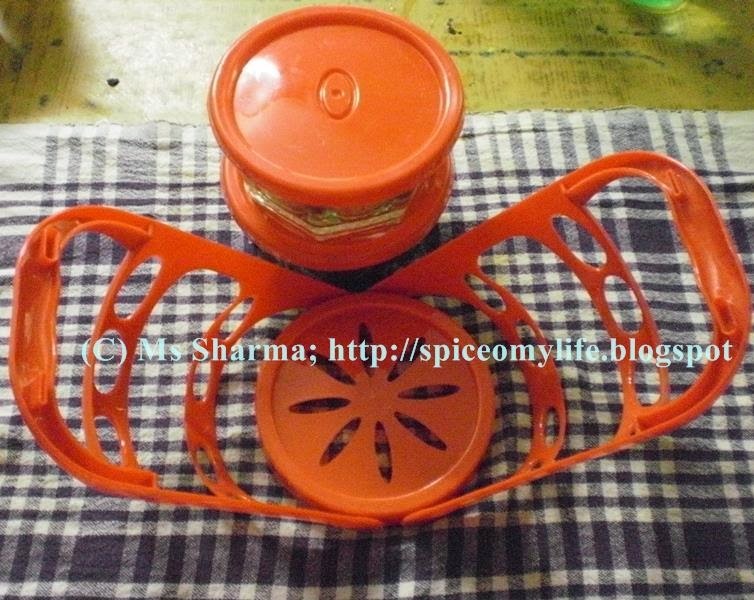 It is easy to carry to table, very handy and easy for storing. Stacking up of bowls one upon another also saves space. What is good is the price. It is very affordable. All in all I felt it was a good buy. Apart from pickles we can serve chutneys, dips or even sauces or crispies in them. So do you want to have one too?